Featured in the REALTORMag YPN Lounge. Have you heard the myth that you cannot be productive in both the sales field and in your office as a broker/owner? Teresa Cowart is a myth-breaker! 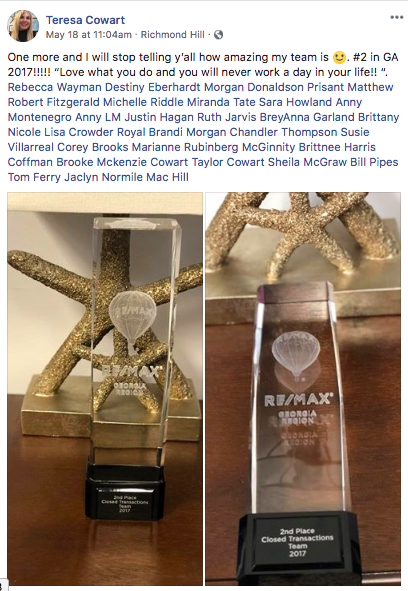 She is one of the owners of the Savannah metro area's RE/MAX Accent (where I have had the privilege of training) and leads a team that closed out last year and has begun this year in the top 5 among all RE/MAX offices in Georgia. I am an early bird. I wake up at 5 am and do my reading, praying, and affirmations; and, usually get to my office 7:30ish. I try to stay true to my schedule and live by my Google calendar. I also time block in order to get the best use of my time. I have a team of 12 agents plus admin, (2 Rentals Coordinators, 4 ISAs, Marketing Manager, 1 Transactions Coordinator, an Office Manager and Listing Coordinator). I try to leave at a reasonable time each day. I typically spend 2 hours in the am 3X a week calling my sphere, past clients and FSBO. In the afternoons and off mornings, I focus on other aspects of the business. I am always looking for the best/next lead generation systems and programs that are available. I also have to spend time reviewing what we are doing now and what the ROI in those. I am constantly evaluating and changing to meet the needs of our clients and the team. We generate leads thru multiple avenues. I believe in not putting all my eggs in one basket. I use the standard ones that others use but on a higher level. Zillow is a huge lead generation system for us. Boomtown, which I have used for seven years as a CRM and for lead generation. I represent a couple of builders and that a great source as well. Trulia, Realtor.com, RE/MAX, BombBomb, Facebook ads and more. I LOVE FB Live Videos and do them regularly I also have a series of Videos I do featuring local businesses that are produced and on FB and Youtube and get shared by tons of folks. I'm a regular on a local TV station as the Real Estate Expert and run commercials. Billboards seem to work for me as well for Brand recognition. The goal is to diverse and to get the best ROI. If the ROI is not there, I drop it. I track EVERYTHING! Every agent on the team is required to spend at least an hour a day on the phone with leads they are not currently working with. The ISA team also calls, text, emails leads all day long. The goal to respond to any lead is 2-5 minutes, if not immediately. My other hat is co-owner of 3 RE/MAX offices and now a Motto Mortgage Coastal. Most of Thursday is spent with activities involving those needs. My partners and I meet in the am and review our companies and where we are so we can make changes accordingly. So every week is a little different for me but they are all busy :). COACHING PLAYBOOK: I have said it before but it bears repeating, stop being an "army of 1". The "army of 1" syndrome develops when we often get started as "solo-preneurs" likely due to cost and inexperience on where to find industry support. I love our tenacity because many of us eventually earn a sustainable income that supersedes anything we previously made in our past careers. But, what we don't realize is that to continue to grow instead of becoming stagnant, we must no longer be "the army of 1". As "the army of 1" there is only so much one person can do in 24 hours in a day and still get sleep! Notice that Teresa does not sell real estate alone (she has a team) nor does she lead her businesses alone (she has a partnership). You may not feel the need to form a partnership but that does not mean you should continue to be a one-(wo)man operation. It is a blessing that in 2018, we have more access to tools (including CRMs), crowdsourcing (including virtual assistants), and the like to give us the support we need at affordable rates. Who is currently helping your business move forward? What additions or subtractions do you need to make? Secondly, notice that Teresa never allows stagnation to set in her process. Likewise, since the world and technology is ever-evolving, it becomes key to routinely (at least yearly but ideally quarterly) evaluate what is working, what is not and what could. When was the last time you evaluated your current methods and systems? If you have not done it since this year began, set a date with yourself to do it before another month goes by to evaluate your effectiveness and areas of improvement. I start each day at 5am with a call into a group of other REALTORS®. It's 5 minutes at 5am. All motivational. I also read at least 10 pages of whatever book I am devouring at the time. Everything I read now is designed to help me grow as a REALTOR® and person. I am constantly motivated by reminding myself that I am the role model for my three daughters. 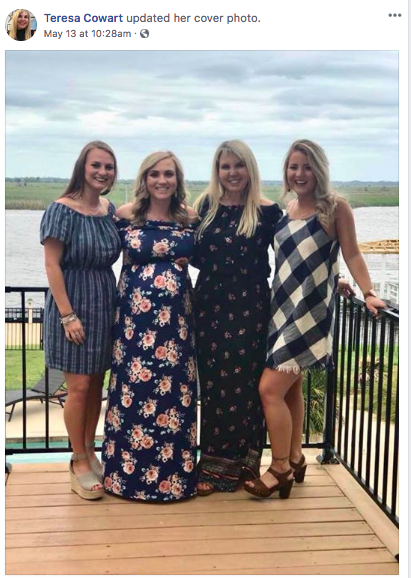 Two of which are in college and one is a teacher now. I am motivated by helping the agents on team succeed. Nothing makes me happier than the joy I feel when they reach their goals. We celebrate everything. At this point growing the business to touch more people is a huge motivator. COACHING PLAYBOOK: I know many of you may also have motivations surrounding your family and your agents. But Teresa does something to protect that motivation from burning out -- she refuels herself through reading, affirmations (mentioned in the first answer above), and connecting with industry peers EVERY work day. The older I get, the more I realize that if a person does not take time to recharge, that person will eventually have nothing to give. Do you have a daily ritual to refresh and renew yourself? If you do not, what can you do for yourself starting today to keep your sanity? What advice do you have for a Real Estate professional that is struggling? My advice is to get help. Join coaching. Get a mentor. Read Everything. Watch webinars. Don't compare yourself to others or even let your drunk monkey get inside your head. Most importantly you have to BELIEVE in yourself. COACHING PLAYBOOK: Do you believe in yourself? I started this article with the myth that I hear so often when I go to conferences and broker summits and that is one cannot be good at both managing a firm and selling in the field -- something will have to suffer. Yes, Teresa defies this myth but so can you! What other myths have been stifling your motivation and success? What help can you get to overcome these hurdles? What are your favorite business tools/resources/apps? I think I covered some of this in the first section. We love the Google apps (Calendar, Drive etc.). I use CTE Biz for tracking. It was designed by a REALTOR® and is great for forecasting and tracking. We also just started experimenting with Neskt. Love SLACK as well. COACHING PLAYBOOK: Sometimes our success hindrance is tied to our systems. How easy are your current tech tools to use for you and anyone else in your firm or own your team? How can you further educate yourself on productivity systems? Remember, these evaluations should at the least be done yearly but ideally quarterly when possible. How did you overcome a low point in your business? I had a radical change in my business in 2013. I found myself very heavily involved with one builder and it made me uncomfortable to have it all in one basket. I also had decided to buy our RE/MAX franchise from the previous owners. I was a little overwhelmed and not sure what to do. I also tracked very little. That year in November I joined coaching and my life changed. I have a great coach who has helped me learn to treat my business like a business. It can survive when I am not here so I can take a vacation and it still runs seamlessly. COACHING PLAYBOOK: What obstacles are you currently facing in your business? Who can you talk with that can offer you impartial, objective advice? Sometimes it is heard to "see the forest for the trees" when you are on the ground, working your business. You may need someone who has a bird's eye-view to help you navigate ditches and other bumps along the road. Remember to ditch the "army of 1" mentality. What is your DISC personality type? I am a D, I. I don't hire them to work for me though lol. COACHING PLAYBOOK: The moment you abandon being the "army of 1" it is vital to connect with people that complement you. Teresa realized this and hires those who are strong in the areas where she may have weaknesses. DISC is not the only way to measure your personality but it is one of the most popular in business with peer-reviewed research for almost one hundred years, so it's not a fly-by-night metric. I had the opportunity to use this in my doctorate research while studying the best practices of some of the top 1,000 real estate sales agents in the nation and DISC was spot-on and easy to understand. Do you know your DISC personality type? If not, there are many free tests online so take one and then look for people who will complement and complete your deficiencies.